and imagining new possibilities for practicing a feminist curiosity that involves a willingness to trouble (feel some anxiety about?) one’s own questions and wonderings. She continues her discussion of anxiety, suggesting that the truly ethical person (which she contrasts with GW Bush) is one who is always anxious and always concerned with whether or not they are doing the right thing; the ethical person is the one who can’t sleep because they are uncertain about what they are doing or failing to do. The responsible being is not the one who does one good deed and then thinks that that makes them an ethical person. The responsible being is the one who thinks they have never done enough, that “they have never taken enough care of the other.” Wow–an ethics of anxiety seems similar to my idea of staying in trouble. I was particularly struck by how she connects this (only fleetingly) to the idea of care. Anxiety and trouble (being troubled, staying troubled) are central to being ethical responsibly and effectively caring for others. Cool. I like her discussion here. I am not sure I like how she describes it as anxiety (in the interview she indicates that she is not suggesting that we should all get anxiety disorders), however. Is anxiety the best (as in most productive, most rewarding, most hopeful, most sustainable) way in which to discuss this mood? Originally my image was only going to include Ronell’s quote, but as I thought about the questions that I posted on my original blog entry about an ethics of anxiety, I decided to contrast the promotion of anxiety, as the ethical (troubled) state par excellence, with my preferred troubled state of curiosity. 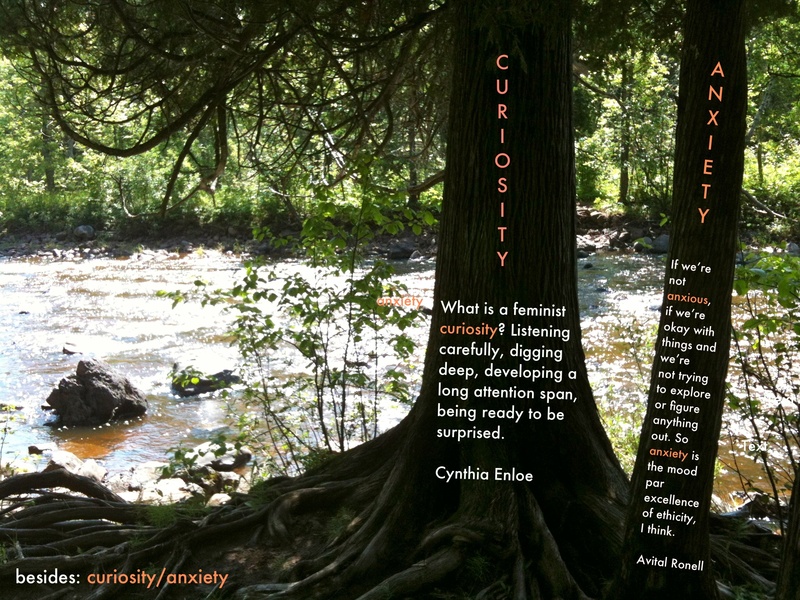 So, I put Ronell’s passage beside a passage from Cynthia Enloe on feminist curiosity, on the two trees. I really liked how it turned out; in some ways, it visually represents the relationship I imagine between curiosity and anxiety for myself. As the more important state, curiosity is on the bigger tree. But, because my curiosity always need to be troubled (questioned for its limits and effects), anxiety, in the form of concern, care and caution, is also always beside that curiosity, on the smaller tree. By the way, in the process of thinking through the image + texts and this post, I’ve come up with a name for my image/text posters: Problematizers. It’s inspired by Michel Foucault and his politics of problematization. Almost 10 years ago, STA and I did two digital videos about the Puotinen family farm. While the films that we made in 2002/2003 weren’t technically sophisticated (we used iMovie, a built-in microphone and some low quality/old photos), I am very proud of them. Through these films, I was able to document two extremely important parts of me (both of which are now gone): our family farm, sold in 2004, and my mom, who died in 2009. 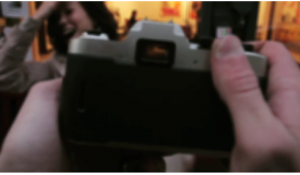 Since the time of making those films, the technology has improved a lot and it’s even easier to create your own digital stories, using photos, voice-over, and video. iMovie is easy to use and there are lots of different apps for creating stories on your smarthphone or iPad. Additionally, communities of scholars, artists, activists and educators have cultivated and are promoting the value of creating and sharing stories digitally. There are classes on digital storytelling (like the awesome class at the University of Minnesota, taught by Rachel Raimist and Walt Jacobs) and a Center for Digital Storytelling (started in the mid-1900s). While I’ve been aware of digital storytelling for several years now, I haven’t read that much about it or tried it out myself. Until now. A few weeks ago, I started writing and thinking a lot about discipline and my own lack of it. The general topic of discipline and being a disciplinary problem aren’t really new for me; they are a focus of this blog. But, something about my current in-between state (in-between teaching gigs, in-between academic and non-academic spaces, in-between a love of learning and being burned out from the academy and formal education), has made the topic of my own un/discipline particularly personal and compelling. After writing a few blog posts about it, I remembered the one and only report card that I still have from my elementary school years: my first grade report card. 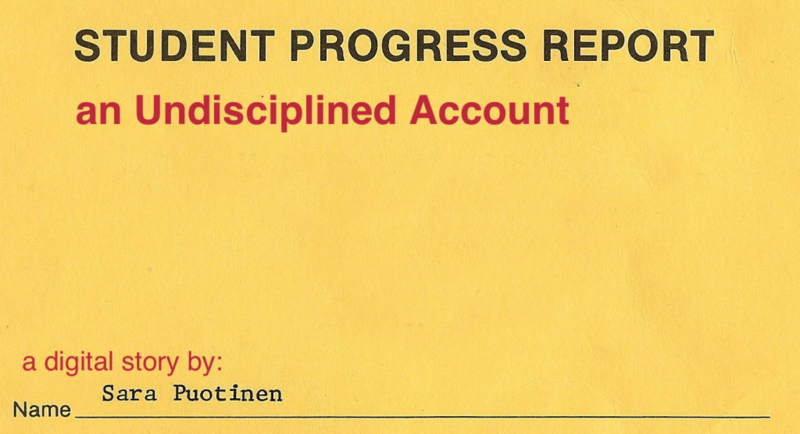 Since this report card has a lot to stay about my lack of self-discipline, it seemed a perfect object/subject for an undisciplined experiment with digital storytelling. 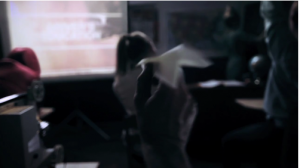 Student Progress Report: An Undisciplined Account from Undisciplined on Vimeo. The Farm Part II: The Puotinen Women from room34 on Vimeo. And adding to the memories that I’ve already posted online, I want to offer up some other materials for the Judith Puotinen archive: A poem about dragonflies, written in April, 1987, shortly after her 45th birthday, and some images from her dragonfly pin collection. Must you spoil my hours on the beach? Turning at a 90 degree angle toward the water. Making me wonder about you dragonfly. Around the delicate eyes of a sunbather. Deliberately investigating creatures in your territory. Pondering why your image sticks in my mind so long. 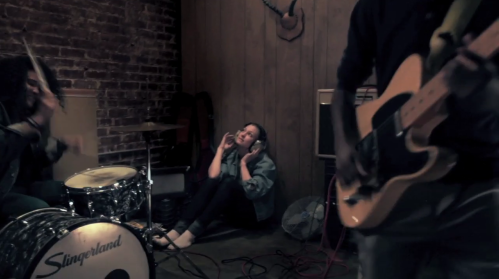 Finding that you are incredibly pleasing. Allowing me now the fun of investigation into your domain. Tricks which are really means of survival and territorial claims. Minnesotan’s north wood’s life–the Mosquito! Feeling gratitude for dragonfly antics on the beach. Wow, I love this poem and how it illustrates some of the qualities that I loved and valued most about my mom: wonder, curiosity, playfulness! How I deeply and desperately miss sitting beside her, maybe on the beach in the Keweenaw Peninsula, sharing in those qualities! This poem is especially valuable to me because it also speaks to my mom’s love of dragonflies. 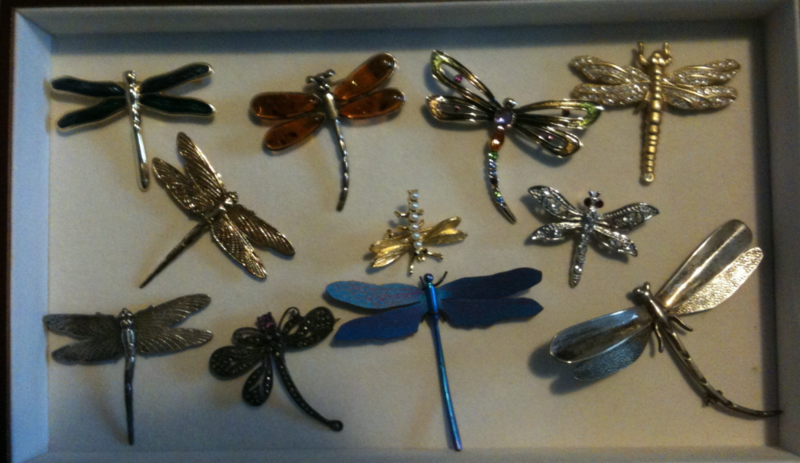 When my sisters and I were dividing up her stuff, I decided to take her dragonfly pin collection. I wasn’t quite sure why I picked it, but after discovering her poem in a random notebook, I know why. This poem and these pins enable me to bear witness (at least in memories) to my mom and her vibrant, joyful, creative/imaginative, always-questioning-and-wondering life. It’s nice to feel joy on her birthday, not just grief. Two other important Puotinen women, both of whom share my mom’s wonderful qualities of joy, imagination and curiosity, celebrate birthdays this month. One turns the same age my mom was when she wrote her dragonfly poem, the other 6. In thinking about my mom this March, I want to also think about and celebrate these other Puotinen women (and even other Puotinen women who weren’t born in March) who carry on her legacy and embody so many of the qualities that I valued most in her.